IF YOU’VE EVER RELIED ON UNCLE SAM FOR YOUR THREE SQUARES A DAY (thanks for your service), you know that, at least in the military, waste is worse than gluttony. Got a man-sized appetite? Great. Go back for seconds. Or thirds. But the taxpayers paid for that creamed chipped beef on toast, so if you put it on your plate, you’d better also put it down your gullet. Take All You Want, but Eat All You Take. Same with composing a street photo. God knows that often you’re up to your armpits in sensory overload. Bright lights, big city, busy intersections, a visual smorgasbord (don’t write posts when you’re hungry!) of input. Sure, you can stick it all in your image, but, in the same way that a shavetail recruit shoves mashed potatoes and ham and ice cream sky-high on his tray….you’d better eat it all. Just showing a chaotic jumble of elements is not “reportage”, nor is it particularly inspiring. You’re on the street to tell a story. If your story is merely “gee, it’s really crowded here today”, you probably need to hone your narrative skills, and it might be smart to start carving stuff out of the composition to, let us say, let it breathe a little. Shoot all you want. Use all you shoot. 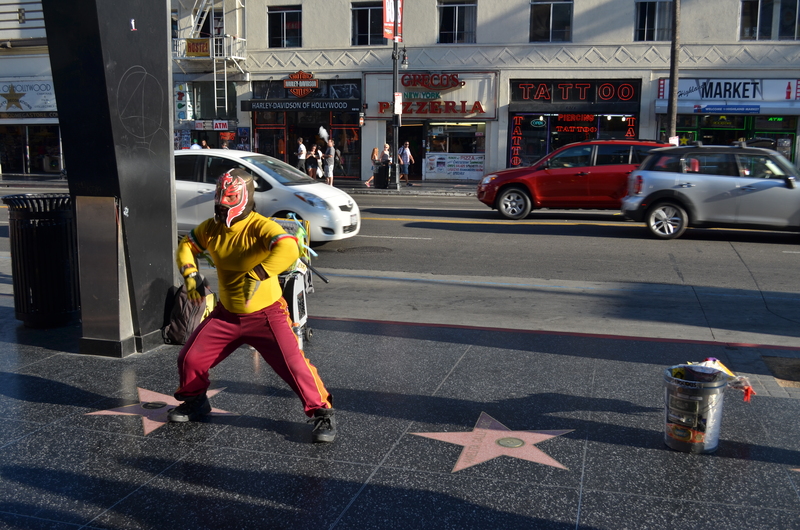 Hollywood Boulevard is a place where absurd levels of street theatre are as normal as fire hydrants and stop lights. It’s in a perpetual state of over-the-top, so much so that it’s damned near impossible, amidst the mimes, acrobats, dancers and show biz mutants, for anyone to draw more than a distracted nanosecond of attention to themselves. Taking photos of this non-stop ballet of weird between jaded tourists and frantic performers can easily become the visual equivalent of the buck private’s overloaded dinner tray. A mess, with all the gravies, juices and seasonings of the city running together. Hollywood Swinging, freestyle: 1/125 sec., f/5.6, ISO 100, 24mm. Or you could try the dead opposite. One Sunday afternoon near sunset, I was lucky enough to see this wondrous fellow, creating his own mix of lucha libre and hip-hop in front of his own sad little stereo, working in isolation just across the street from the most heavily trafficked sites in that part of Hollywood. After shooting a few frames that showed him from several angles, I decided that his performance was story enough, all by itself. I didn’t need to show the thrilled reaction of passersby, or frame the shot to include popular destinations like the Chinese theatre or the teeming souvenir shops that scream so loudly up and down the block. Simply, including all that other glitter and glitz would have robbed our friend of his moment in the sun. I just liked him better as king of the block. Which is all to say, some photos need side dishes. Sometimes, however, you just want the meat and potatoes. Again, never write when you’re hungry. This entry was posted on August 29, 2014 by Michael Perkins. It was filed under America, Composition, Framing, Popular Culture, Street Photography . I`m new to blogging . Is eat all you take a blog? Sounds a bit pretentious to me . It’s just the title of the single post, and harks back to the old rule in Army mess halls that you could have all the food you wanted, so long as you didn’t waste it. I was trying to make the point that you can put all the visual elements in a photo that you need, but that you must manage them correctly…or “eat all you take”. Not my greatest concept but just a way of getting into the subject with a bit of a grin. Thanks for visiting!